United by their love of story-telling as well as their unbreakable bond as sisters, Rebecca and Megan Lovell have created their band, Larkin Poe. The two sisters are 19 and 20 making their musical career even more interesting as fans can expect to enjoy the musical products of their creativity for a long time to come. Larkin Poe is full of spirited vocals, acoustic guitar, and country themes. Rebecca and Megan have created the quintessential road trip soundtrack that just asks the listener to roll down the window and enjoy the breeze as they take in the girl’s refreshing lyrics. In 2010, Larkin Poe released 4 seasonally themed EPs. Listeners should be excited to delve into the band as the seasons change and their music matches the mood outdoors. Their music is easily accessible to viewers as their seasons EPs are all available to listen to on their website for free. Larkin Poe is making limited stops in the U.S. including UPB’s Spotlight Series in Taylor Down Under TONIGHT at 8pm as well as various places in Florida, Nevada, and Georgia. The girls will be sure to please listeners as they sing in the intimate venue of TDU making their music even more of a personal story telling performance. On Wednesday March 30th, TDU will be filled with soul! UPB’s Spotlight Series is bringing a singer/songwriter from Rochester, NY to our neck of the woods. Micah is a musician with a great textured voice that soothes all those who listen. He went to Northeastern for music business and is experiencing life as a starving musician sharing his talent with all who will listen. As well as having a voice that will melt your heart, Micah also has other interests. When we visited his twitter his description reads, “musician, cookie enthusiast, high-five giver”. He has a great sense of humor and we cannot wait to meet him on Wednesday and you should too! Wednesday March 30th. TDU. Spotlight Series. Be there!! Craving some delicious alternative and electronic pop music? Audiostrobelight can satisfy that craving! Hailing from Virginia Beach, this group of has become known for their high-energy shows all throughout venues in Virginia Beach and Norfolk areas. They have opened for a range of major artists including Fall Out Boy, +44, Cobra Starship, Say Anything, Taking Back Sunday, and more! Accompanying Audiostrobelight will be another band from Great Falls, Virginia, Radioviolet, also described as a modern alternative rock band. The band prides itself on trying to bring back good instrumental solos and synthesizer parts like those in the progressive rock of the 1970s. The combination of these two dynamic bands is definitely not a show you want to miss! Come out to Taylor Down Under on Wednesday, February 23rd at 8:00 pm to see these guys rock out in person! Starting this semester, Spotlight Sounds’ Spotlight Series will be featuring two acts per month, one being an act that the committee brings on to campus, the other being a JMU student act. The goal for the Spotlight committee this semester is to showcase a diverse array of music as well as to help up and coming bands get their names and music out to the community. Tonight, JMU Junior Andrew Rohlk, winner of last December’s Rumble Down Under, will be performing in Taylor Down Under at 8 p.m. Spotlight Sounds hosts Rumble Down Under in TDU as a battle of the bands, in which 8 student bands or singer/songwriters perform in front of a panel of judges and an audience of students. While the judges of RDU gave Andrew high marks, the students showed equal support, as he was one of the top runners in the fan vote. 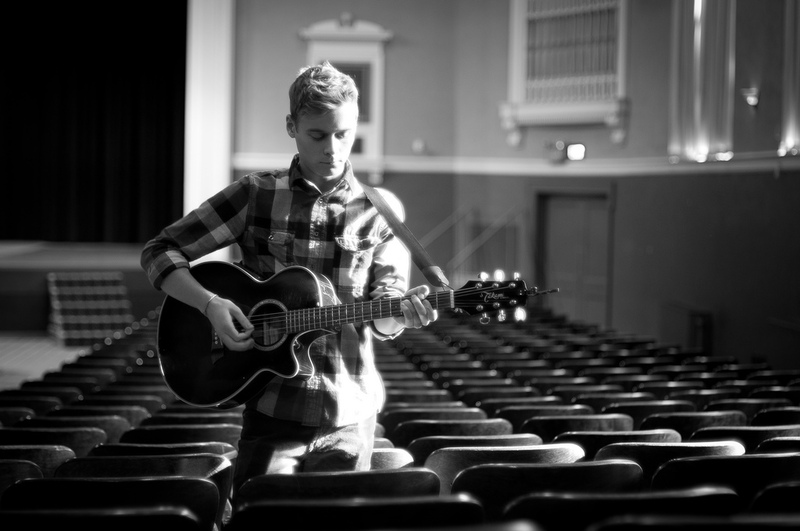 Andrew is a singer/songwriter who has been likened to John Mayer, but pulls from a wide variety of music for his influences. Andrew is a friend and fellow band member of Trinity Edralin, who kicked off our Spotlight Series back in September. Currently, he is recording a new solo EP. Needless to say, as the winner of RDU, Andrew has great talent and the Spotlight committee hopes to see plenty of students at TDU tonight at 8 p.m. when he will showcase his music for the JMU and Harrisonburg community! This is what I envision whenever I listen to Ameranouche, the gypsy jazz trio traveling to JMU tonight, November 10th, to play in TDU at 8 PM. It’s a trick my mom taught me whenever she made me listen to new music that I found too different to appreciate. Sit back, close your eyes and think of what’s happening with this song as the background. Soon you’ll be so immersed in your imagination that you’ll never want the music to end.